Cycling is environmentally cool, right? Cyclists are not merely friends of the Earth but lovers, carers and life-long best mates, right? Bicycles are as benign as a gentle breeze wafting a summer meadow, right? Wrong. A new report says otherwise. It lays bare the impact that manufacturing bikes has on the environment. It’s not pretty. Just in case you suspect that it’s propaganda put out by the roads lobby or auto industry, you should know that it’s actually been produced at the expense of, and with huge help from, the third largest US bike seller, Specialized. 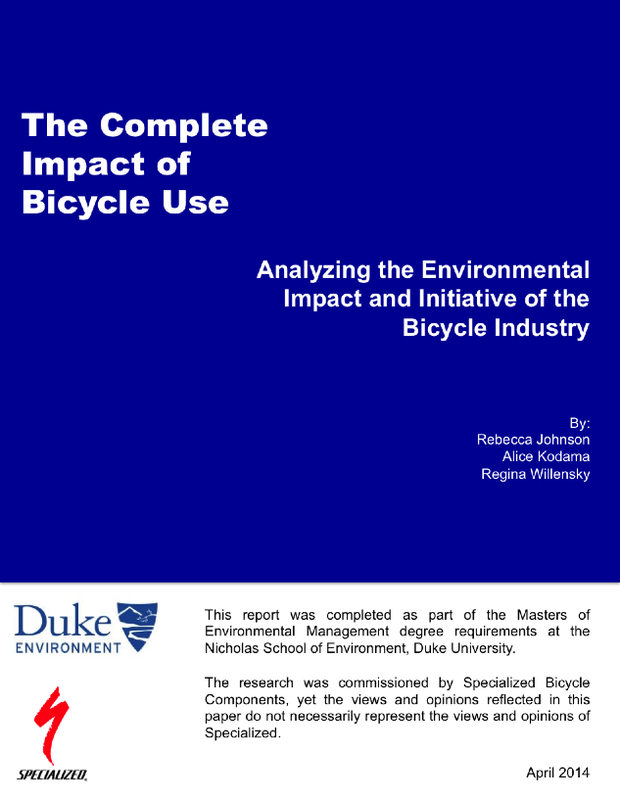 With their income from 9% of the US bicycle market, they’ve paid three post-graduates at Nicholas School of Environment, Duke University, to dig the dirt on how much of our planet’s resources are used and abused to make the machines we love. It’s a big report. There’s a massive amount of detail. It deserves to be studied and the facts and figures broadcast, published and gossipped. Such as the fact that it takes more than 30,000 litres of water to make just one Roubaix fork. Specialized uses enough water making Roubaix frames to supply the water needed by 477,000 people per year. “These numbers are staggering”, say the authors. Other figures are equally shocking. In making all of the Allez framesets that are sold in a year, 6.4 million kilos of carbon dioxide equivalent are released into the atmosphere. 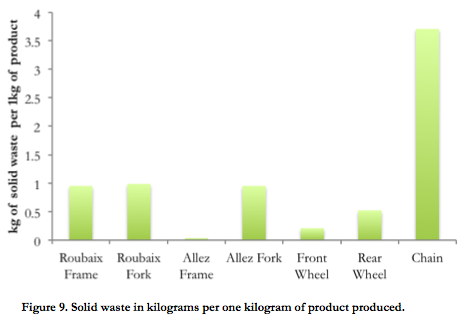 To make the Roubaix frame, 1.01kg of waste are generated. For every kilogram of chain produced, there’s an astonishing 3.69kg of waste. I won’t go on – you can read, open-mouthed, all 179 pages of the report yourself. Download it here. And do compare it with the impacts of other forms of travel, as detailed in the first chapter of my book, Cycling Science. Of course, Specialized doesn’t do any of the manufacturing itself. It’s done mostly in China and Taiwan, with some components made in Japan. Each country, and each region within it, has different environmental goals. Some even have to meet national or international standards. And Specialized must be applauded for being so candid about the impact that the making of their bikes is having on Earth. If ths publication can encourage other manufacturers to be equally transparent then there is hope that they will all work together to reduce their eco-footprint – not to boost cycling’s genuine green credentials but for the sake of the planet. This entry was posted on 30/04/2014 at 1:49 pm and is filed under Environment, Pollution, Specialized. You can follow any responses to this entry through the RSS 2.0 feed. You can leave a response, or trackback from your own site. I am riding an old Raleigh Twenty that had been abandoned in a shed years ago. I rescued it from being taken to the dump and spent half an hour pumping up the tyres, oiling the chain and adjusting the brakes. It obviously used some resources in its original manufacture (no aluminium or carbon fibre though) but I would say that it is a pretty green way for me to get around. ianji’s points are well taken. (b) sticking with a bike, maintaining it for a lifetime or even half a lifetime goes a long way to amortizing the energy and materials required for its manufacture. – the race to high performance materials that have (in some cases) staggering ecological footprints.